Layers: 20+ aprox + Layer groups. â? ?When you realize how perfect everything is you will tilt your head back and laugh at the skyâ??. So... Its simple, clean and has a little space for icons in the desktop or whatever u like x), i guess! In this scene i didn't use real clouds or cloud brush, so i decided to paint it myself. 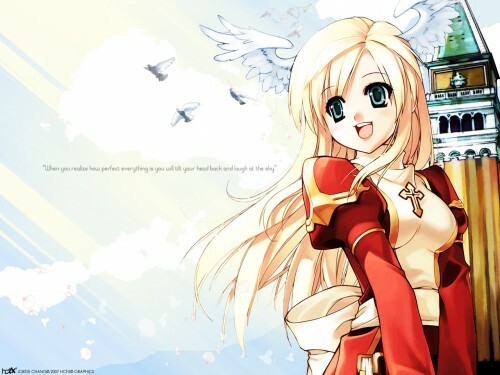 The character is from Ragnarok Online. Any problems, comments, suggestion are very appreciated, +fav if you like. waaaahhhh! so cute honchay! I didnt know you were workin on a wall. hehe. very very pretty and simple. I love that clean look with a clear blue sky and pretty doves. im definitely setting this as my desktop bg.